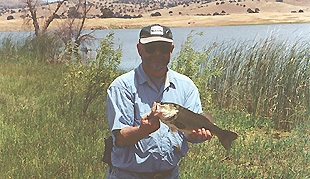 On June 2, 2001 seven club members made the trip to Kelsey Ranch in search of bass. Where, you may ask, is Kelsey Ranch? The ranch is just a little ways outside of Snelling which is located along the Merced River just below Lake McSwain. Snelling is south of Modesto, but not as far as Fresno. After experiencing some automobile difficulty George Conway arrived at the lake to find the members working hard to catch some BASS. The early morning proved be the best bite and George and I had missed it. Being the fishmaster for this outing meant that George and I had arrived in time to start lunch. This fishout included BBQ Burgers. We rapidly began setting up and starting the coals for the BBQ. While the coals started I tried an area just off from the boat dock and was rewarded by a nice surface take. That was all that was needed. Quickly a couple of club members came over to test the water to learn if any of the bass'es cousins were around. Just up the shore a little ways Dave Black was busy landing his own "Mr. Mean". Those of you that have caught bass on the surface with a fly rod know what I am saying. 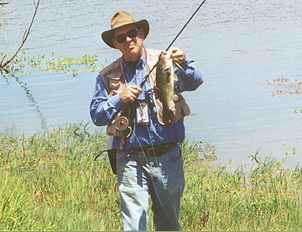 We lunched on a great BBQ, Burger lunch prepared by the fishmasters and got back to the business of catching bass. Tom Kilfoil applied his skill and managed to bring in several nice fish. Phil Drees was over in a weed bed pulling fish from the weeds. We noticed Phil and Dave coming across the lake in that new boat. They found plenty of bass in deep weed cover. The problem was separating the bass from the weeds. It was early, but time for George and I to retrieve our vehicle from the repair shop. We left our crew busy casting to difficult fish. Fishing wasn�t easy this day, it took work. Most everyone caught some fish. It was exciting. All in all, it was a successful day at Kelsey Ranch and we anticipate that many fish will be there for our next trip.